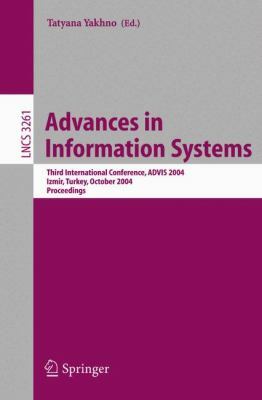 This book constitutes the refereed proceedings of the Third International Conference on Advances in Information Systems, ADVIS 2004, held in Izmir, Turkey in October 2004. The 61 revised full papers presented were carefully reviewed and selected from 203 submissions. The papers are organized in topical sections on databases and datawarehouses, data mining and knowledge discovery, Web information systems development, information systems development and management, information retrieval, parallel and distributed data processing, multimedia information systems, information privacy and security, evolutionary and knowledge-based systems, software engineering and business process modeling, and network management.Yakhno, Tatyana is the author of 'Advances In Information Systems Third International Conference, Advis 2004, Izmir, Turkey, October 20-22, 2004. Proceedings', published 2004 under ISBN 9783540234784 and ISBN 3540234780. Loading marketplace prices 144 copies from $139.23 How does the rental process work?